Kubernetes includes a feature called services which serve as a kind of load balancer for pods. When pods misbehave or otherwise stop working, sometimes you'll want to remove the pod from the service without killing the pod. Each service has a list of endpoints for the service which correspond to the pods for that service. This list of endpoints is updated automatically with the IPs and ports for the pods based on a label selector defined on the service. This allows the service to be loosely coupled to the pods themselves. You can see the selector pattern used in many other kubernetes components like Deployments and ReplicaSets. Because the list of endpoints is updated automatically based on the label selector, we take take misbehaving pods off of the endpoints for debugging and maintenance by updating the labels on the pod so that it doesn't match the selector. In order for us to update a service selector so that pods can be removed from it we will need to have a selector that can be easily updated. In order to do that we'll add a label that we can toggle to take any of our pods out of service. After we create our deployment and service we would have some pods running. We can list the pod endpoints here too. Let's take the pod nginx-1802606028-1posu out for maintenance. First let's note it's pod IP. Now, to put the pod under maintenance we can change the enabled label to something other than "true". We need to pass the --overwrite flag to update an existing label. If we check the endpoints again we would notice that we still have two endpoints. This is because the deployment has recognized based on it's own selector that it should start another pod. We can notice here that our pod under maintenance is no longer in the endpoints. We can now do maintenance on our pod. How you perform maintenance on your pod will be highly application specific so I won't go into it a whole lot here. 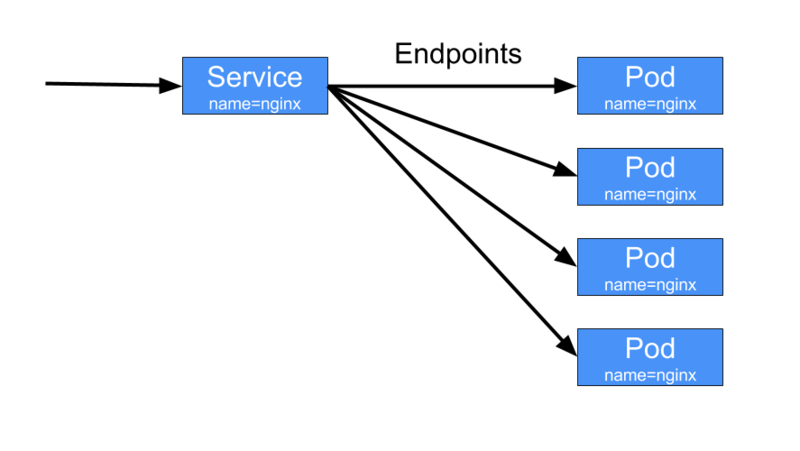 However, Kubernetes provides a few features that make it easy to connect to applications running in your cluster so I'll mention those briefly. You can attach to an running pod in order to send it data on stdin and get debugging info on stdout. This is great if your process allows you to send it commands on stdin to get info on it's internal state. Some containers however, don't create a TTY. You will be able to see stdout but this is very close to just using kubectl logs. 127.0.0.1 - - [13/Sep/2016:02:51:06 +0000] "GET / HTTP/1.1" 200 612 "-" "Mozilla/5.0 (Macintosh; Intel Mac OS X 10_11_6) AppleWebKit/537.36 (KHTML, like Gecko) Chrome/53.0.2785.101 Safari/537.36" "-"
2016/09/13 02:51:07 [error] 5#5: *1 open() "/usr/share/nginx/html/favicon.ico" failed (2: No such file or directory), client: 127.0.0.1, server: localhost, request: "GET /favicon.ico HTTP/1.1", host: "localhost:8000", referrer: "http://localhost:8000/"
127.0.0.1 - - [13/Sep/2016:02:51:07 +0000] "GET /favicon.ico HTTP/1.1" 404 571 "http://localhost:8000/" "Mozilla/5.0 (Macintosh; Intel Mac OS X 10_11_6) AppleWebKit/537.36 (KHTML, like Gecko) Chrome/53.0.2785.101 Safari/537.36" "-"
kubectl exec allows you to execute a command in a container. You can use this to do any number of things, but perhaps you might use it to send a signal to a process in the container. Or you could just start up a bash shell if bash is installed. Another useful feature is port forwarding. We can use this to forward a local port to our pod so we can send it requests and see how it responds. After that we can send it requests from another terminal. Label selectors make it easy to take pods out for maintenance. There are some things you need to keep in mind though. Because Services and Deployments often both use label selectors it is possible to take a pod out for maintenance but leave it as part of the Deployment. This is fine in many circumstances, but if you have a Deployment with a HorizontalPodAutoscaler, the Deployment could scale down and delete your pod at any time. Also, while a single pod taken out of service isn't much, it still may have a performance impact on your application. For these reasons I would suggest taking it out of the Deployment as well and have the Deployment start up a replacement pod. After we are done maintenance on our pod we may want to put it back into the service. You can do this by updating the label again to match the service selector. This is great if your pod is part of a PetSet or restarting it is hard. But if we are using Deployments, and since the pod was acting flaky to begin with, and pods in a Deployment are by definition replaceable, we should probably just delete the pod. Even if we added it back to the Deployment, the Deployment would notice that it has one too many pods and delete one anyway. If you keep these things in mind, finding out why a particular pod was acting up in production can be a relatively smooth experience.